A section of SCP-2978-A-9, note that no SCP-2978-B are visible at this magnification. Special Containment Procedures: All instances of SCP-2978 are currently contained in Site-17, secured in a biometrically locked chamber. The containment chamber, and all SCP-2978 communities within, are to be observed at all times using high-speed HD camera surveillance and digital microscope systems. Access is limited to Level 2 staff. No storage peripherals exceeding 128MB in size are to be inserted into any SCP-2978-A instance. Should populations of SCP-2978-B increase to over SCP-2978-A capacity, additional sections of compatible hardware are to be added to prevent overpopulation events. Addendum-2978-02: Following Test-2978-23, a second biometrically secured entrance has been added outside the primary containment cell. Additionally, no wireless networking peripherals are permitted for use with SCP-2978. Description: SCP-2978 consists of two anomalies, SCP-2978-A and SCP-2978-B. SCP-2978-A is a collection of ██ anomalously modified Intel D945GCPE microATX motherboards normally found in Intel Pentium 4 Personal computers. Anomalous properties are only apparent when examined in close proximity. 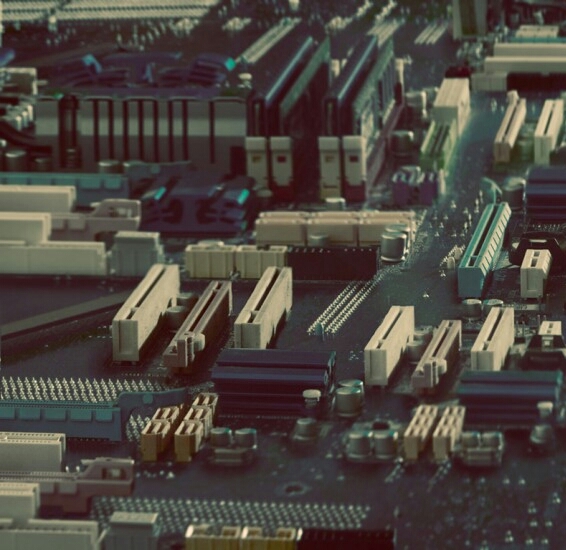 All components of the motherboards are modified to function as a miniaturized urban city environment. All USB ports of SCP-2978-A were occupied by ██ [REDACTED] brand 256MB USB drives when recovered. These thumb drives have resisted all attempts at removal thus far (Number of thumb drives reduced to ██, see Event-2978-Beta). SCP-2978-B are a race of silicon-based, humanoid individuals measuring 400-500µm in height and weighing 50-80µg variably. All SCP-2978-B have a green skin tone with no visible hair; however, each individual has a unique physical appearance, behavior and personal life within the SCP-2978 community. SCP-2978-B emulate a human society, with technology analogous to the 1990's. Individuals use a modified version of English for communication and do not need sustenance. SCP-2978-B have a lifespan of approximately 90 hours (this includes: birth, schooling, careers, reproduction, family life and death). High-speed camera equipment is required to observe individuals' daily lives. SCP-2978-B seem incapable of perceiving humans, the exception being an individual named "Our Father" (hereafter referred to as POI-2978). SCP-2978-B can, however, be physically interacted with, causing various detrimental effects to their perceived normalcy. References to POI-2978 appear in media and religious depictions in SCP-2978 communities. Once compatible hardware makes physical contact with an SCP-2978-A instance, it will be converted into an SCP-2978-A, by SCP-2978-B individuals, within 11 to 15 hours depending on complexity. Hardware manufactured after 20██ does not seem to be affected by SCP-2978-A's modifications. Current theories are that SCP-2978 instances have a set software version, only updated by the creator of SCP-2978. This would have stopped after 20██, the year of containment. All communities are named "Motherburg", with the suffix "V1.x" added to each new iteration. On all SCP-2978-A instances, the following will be printed on an upright transistor, located near the edge of the motherboard: "Welcome to Motherburg, Population:(variable)". As of 04/10/20██, "Motherburg V1.██" is the last community to have been built. No power source is utilized for the functioning of SCP-2978. On 24/12/20██ Junior Researcher Milborrow, was seen commencing daily observations. Of note, he had not informed staff that he had been experiencing a head lice infestation. After concluding observation, surveillance footage shows him scratching his scalp as he leaves containment. Digital microscope footage shows numerous SCP-2978-B individuals fleeing an area of SCP-2978-A-24. Intercepted media from SCP-2978 shows local news reporting the appearance of "monsters", encouraging community members to flee to SCP-2978-25. After moving the position of SCP-2978-24's digital microscope, 3 Pediculus humanus capitis (Head louse) are seen crossing the object's surface. 5 minutes after contact, all SCP-2978-B individuals have evacuated SCP-2978-24. Due to the unexpected nature of the event, numerous SCP-2978-A-25 structures served the secondary purpose of a makeshift dwelling. Researcher Eddleston expressed interest in the preceding events and obtained Site Director permission to continue observation. In the following hour, the first increases in birthrates were observed, possibly caused by overcrowding. Neighboring SCP-2978 communities expressed disinterest in allowing the immigration of SCP-2978-B individuals. 2 hours after Event-2978-Beta began, living space had become a serious problem and births had increased further. Neighboring SCP-2978-A communities enacted border patrols which prevented immigration, causing hostility. At the 4 hour mark, the lice, still present on SCP-2978-24, were seen behaving as typical to their species, with a single louse moving towards SCP-2978-25. No attempts of their removal had been made. Living space and resources had now become critical problems on SCP-2978-25, with rioting and violence becoming a common occurrence. At this point, a small group of SCP-2978-B individuals was sent into SCP-2978-24. The group is seen moving towards the thumb drive on SCP-2978-24. After reaching their destination, 2 individuals are seen entering the storage peripheral. 3 seconds after entering, an explosion occurs in containment. The explosion obliterates SCP-2978-24 and damages 3 additional communities, causing ████ SCP-2978-B deaths. All head lice are destroyed in the explosion. Researcher Eddleston received minor trauma to the face and neck, caused by shrapnel. Mass hysteria was observed following the event, during which 3 new motherboards were introduced to SCP-2978-A, for conversion. These new motherboards were placed in SCP-2978-24's former location and in close proximity of communities affected by the explosion. Conversion events occurred as per normal and repopulation proceeded smoothly over the following 12 hours. Prayers and offerings to POI-2978 increased exponentially over the following days, thanking them for the new dwellings. After the described events, it has been determined that all thumb drives have been modified with an explosive of unknown origin. These devices are most likely reserved for emergency situations and are not to be tampered with. Outside influence, resulting in mass panic, is therefore actively discouraged. Containment procedures have been updated. On ██/██/20██, researchers printed a microscopic message on a grain of rice. The message contained three questions. The responses were printed on a piece of prism-shaped silicon, placed near the rice grain. The responses were penned by the leader of SCP-2978-██. When were you created? Oh, Our Father, a joying occasion, Thyour words grace our optics. Thyou, All-knowing, must be testing us forsurely. For Thyou are the creator, we will respond to Thyour debug neverthelesser. I was borned on the 55th cycle in 245B8 during the second flash, but our worlds were borned when Thyour servants awoke, 245B8 switches ago. Who is your creator? Most Grace, having Thyou forgotten us? We know Thyou everycycle of everyswitch since our birth. Thyou are our creator, Our Father, Kinger of Kings, our reason for birth and death. Having Thyou come to take us all to The Version? Does our response be to Thyour satisfaction? It has been EF88 switches since your last debug. Why does Thyou communicate to us with this manner? What is your purpose? Our purpose, Greatest and Only, Is to live through Thyour word and be worthy for The Fatherboard, has the final switch come? Will our 2nd Version be realized? Is it now? For we will be ready. The area where the grain of rice was placed was flooded with activity over the next few hours and has since become a place of religious significance to SCP-2978-B individuals, being the most visited of all SCP-2978-A locations. All communication has since been ceased. Foreword: Researcher Eddleston is testing conversion of non-compatible hardware with SCP-2978-A. 18:47: Researcher Eddleston is seen inserting generic brand of mobile broadband modem into a USB port on SCP-2978-A-██, the latest iteration. Tested USB port is noted to function as a bus station for SCP-2978-A. 18:50: Researcher Eddleston finishes prepping of Test and leaves containment chamber. 18:55: Microscopic imaging indicates increased movement of SCP-2978-B individuals in the area. 19:41: No changes in mobile router. SCP-2978 media shows increased attention to the inserted router. 19:59: First drastic changes in SCP-2978 stock exchange noted, with tech company "MotherTech" stock prices increasing by 1000%. 13:57: Attempt is made to contact Researcher Eddleston; he is unavailable but notified of progress. Telephone conversation indicates him ordering junior researchers to keep testing active until his arrival. 14:32: Hundreds of SCP-2978-B individuals observed to enter tested USB port containing router. 14:33: Junior Researcher Matthews enters containment, intending to halt current test. 14:33: Wireless modem ejects from USB port, traveling at 18 km/h. Modem now referred to as SCP-2978-A-Alpha. 14:34: SCP-2978-A-Alpha appears to be an aerial exploration vehicle piloted by SCP-2978-B individuals. Method of propulsion is unknown. It is observed by high-speed cameras, circling the containment area once and escaping containment. 14:35: Containment breach alarm is activated. SCP-2978-A-Alpha is seen traveling at 20 km/h through site hallways. 14:36: SCP-2978-A-Alpha is seen entering ventilation ducts. 14:38: Visual contact with SCP-2978-A-Alpha is lost. SCP-2978-A-ALPHA's current whereabouts are unknown. Site-wide sweeps have been inconclusive. Disciplinary action has been taken against SCP-2978 research team. Researcher Eddleston has been reprimanded for his actions. A statement is observed on the now disused USB port, it reads: "Our Fathers gift, a vessel for thyose brave enough to find Him and It, in life." SCP-2978 was found in the home of discredited bio-engineer Dr. █████ ██████ after a fire almost destroyed his residence. A total number of ██ SCP-2978-A instances were destroyed in the fire, with ██████ SCP-2978-B deaths. SCP-2978 media covered the event for 3 months and a memorial plaque was erected on SCP-2978-A-1 by its community. Dr. █████ ██████'s current whereabouts are unknown.